Then, I recalled the picture of the tarte at Australian MasterChef website and remember that the caramel of the MasterChef tarte is actually as dark and deep like mine. So, I embraced myself to take the first bite and it was surprisingly delicious. It was not burnt at all and both apple and pastry were very nicely cooked together. "Follow the recipe to the tee. Don't vary it, don't move it, don't do anything other than what the hell's on the recipe - Aaron (MasterChef season one contestant)"
"...be careful not to cut your apples too thin"
" cutting each quarter at the core so it has a “flat” side"
"When it's rested for ten minutes, you should be able to put your hand on the top of the tarte and spin it round. This is a really important part of the whole process. If it doesn't move, it's stuck - Gary (MasterChef judge)"
Zoe: Oh man! Mine is stuck!!! For an extra challenge, I have actually made my own puff pastry (in a rough form) and I reckon my pastry looks a little too thin and "brittle" for my 26 cm tarte but I was lucky again that most of the pastry on the tarte survive after the flip. Overall, it was a fun cooking experiment. I reckon that my thin but flaky and buttery pastry was in its right amount to compliment the caramel apples and the whole tarte was all gone in a flash. However, to be on the safe side, I will increase the amount of pastry slightly if I'm baking this again. "Did I burn my tarte?"... Luckily, I didn't. Phew! Most part of my tarte survived! 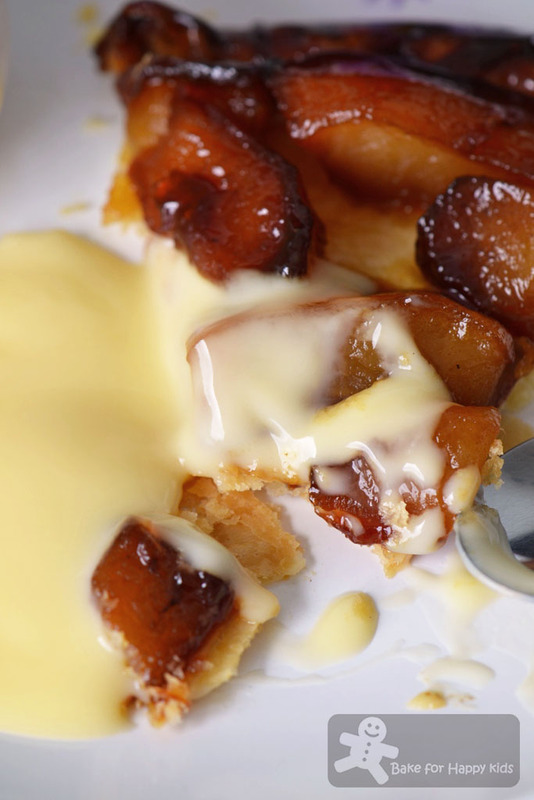 We are enjoying this combination of flaky pastry and deeply caramelised apples with custard. Yum! Here are the recipes (with my modification in blue). Peel apples, cut into quarters, remove cores (cutting each quarter at the core so it has a “flat” side) (I don't really understand this and so I cut my apples to eighths), and toss the apples in a large bowl with the lemon juice and 1 tbsp of the sugar. 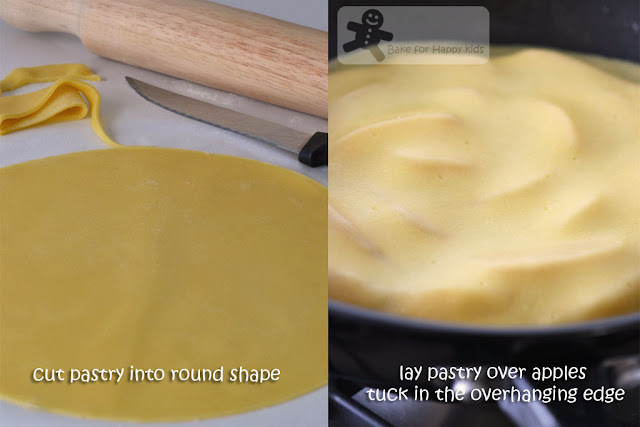 Using a 20cm frying pan as a guide, cut pastry into a round slightly larger than the pan, prick with a fork. 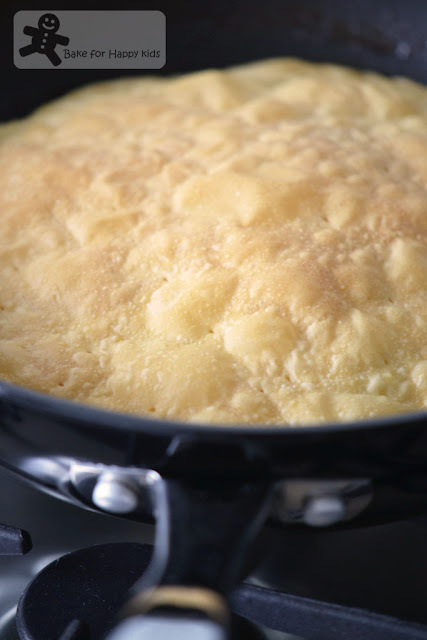 Melt butter in a 20cm non-stick frying pan (Mine is 26 cm) over medium-high heat. Cover with the remaining sugar. 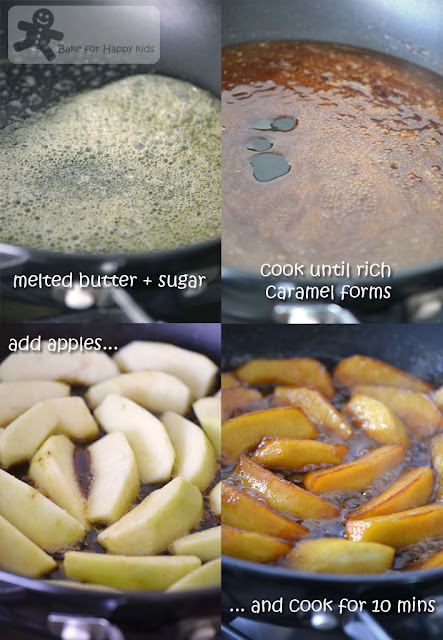 Cook over medium-low heat, shaking pan occasionally to spread around any dark spots that appear, until a rich caramel forms. Lay the pastry over the apples, tucking any protruding edges around edges of pan. This is an easier version of puff pastry. It can rise almost as much as the classic puff pastry but without having layers of butter folded inside it. Mound the flour on a work surface and make a well in the centre. Add the butter and salt to the well and use your fingertips to gradually rub the flour into the butter. 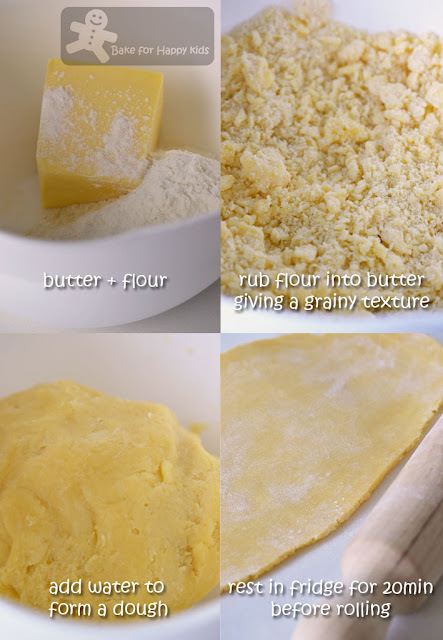 When the butter is in small pieces, giving the flour a grainy texture, gradually add the water. Mix until just incorporated into a dough. Shape into a disc and cover in plastic wrap. Chill in the refrigerator for 20 min. Place the pastry on a lightly floured work surface and roll it away from you into a long rectangle, about 20 x 40 cm (I didn't measure mine but definitely smaller than this size). Fold in one of the ends, going two-thirds of the way to the other end. Fold the other end on top, giving a stack of three layers like a folded pamphlet. 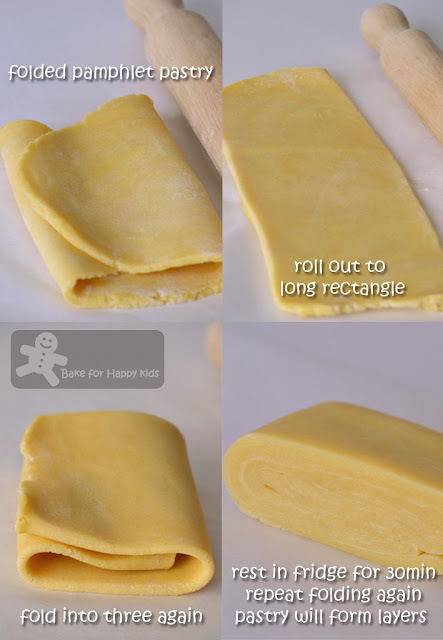 Turn the stack so a short edge is facing you and roll out to another long rectangle, then fold into three again. Cover in plastic wrap and chill for another 30 min. Repeat another set of rolls and folds (2 of each) and chill for another 30 min. The pastry is now ready to use. If you don't need to use all the pastry at once, it can be frozen. Note: Using 1/4 of the recipe, I have made about 300g of pastry and used only half for making my tarte tatin. Terrific instructions and post. I've had this dish several times, but never made one. And it's so pretty! Awesome job with this - thanks. Zoe, we went to pick apples last 2 weeks and there are still lots of the apples lying in my fridge awaiting me!! your recipe comes just in time! thanks! I can't believe that I still haven't made my melting moments, hahaha! I had lots of homemade Shanghai mooncake recently so not keen to make sweet cookie again! Need to take a rest first. I would like to try your apple tarte tatin please! I've been wanting to make an apple tarte tatin for awhile. This looks great! Omg, im drooling just looking at the last picture! Warm apple tart with custard cream....heaven! I mustn't be too lazy to make my own puff pastry....hope looking at your picture will motivate me to bake it...ms! I've been wanting to make apple tarte tatin for awhile. This looks great! Hi Zoe, what burnt? It looks gorgeoussssssss! The colour is how it should be, you did an excellent job! And to make your own puff pastry too, wow. I think I may attempt this too! I'm a huge huge fan of tarte tatin and your's looks awesome... I just made some once or twice and it's true that it can be a little bit tricky... But with that taste, definitly worth the effort... It's a beautiful tart! Oh, what a treat. It is certainly not burnt, and it looks fantastic. I love the step-by-step visuals you provided. Those pictures make me so hungry! Zoe, this looks good. I should give it a try when I have extra apples at home. Those apples look especially good! your instructions were awesome zoe! it doesn't look burnt at all and delicious beyond belief!!!! It looks delicious! And the puff pastry you made looks great! Burnt????where?????? Girl this is one hell of a tatin with absolutely lovely caramel colour and paired with that custard....yummmmmmmmm and to top it all you even made your own puff pastry!! Take a bow Zoe! I've never made a tarte tartin, but that recipe does start out in an intimidating fashion! Ooh yummy! Thanks to your lovely comments on my blog I found yours and I'm so glad I did! I love your photography, it all looks so delicious! I've been wanting to make Tart Tatin for a while and yours looks fab! Heavenly! I love caramelized apples. There is something about apples and pastry with a dollop of custard that takes me right back to being at school! I've used the same recipe and it worked beautifully! Your pics just made me hungry! Thanks for visiting my blog. What a great dessert....the apples look delicious! Love all your step by step pictures! This looks delicious! Perfect for the apple season that's coming upon us here in NY. Yum! 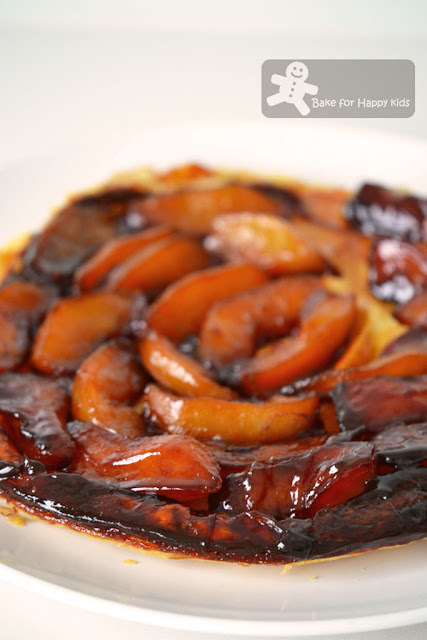 Apple is my all time favorite filling for desserts, this tarte-tatin is awesome!! I would really like to have a piece now!! Thats an incredible tarte tatin..
That made me smile! Actually, your tart looks perfect! I love that dark look on a tarte tatin. One of my favorite cookbook authors, Maida Heatter, gives such involved instructions you almost hesitate starting the recipe. But....I've never had of her desserts fail. You can mess around with instructions for just about anything else, but not desserts and baking. your tarte tatin looks perfect (tarte tatin is may favourite cake)! 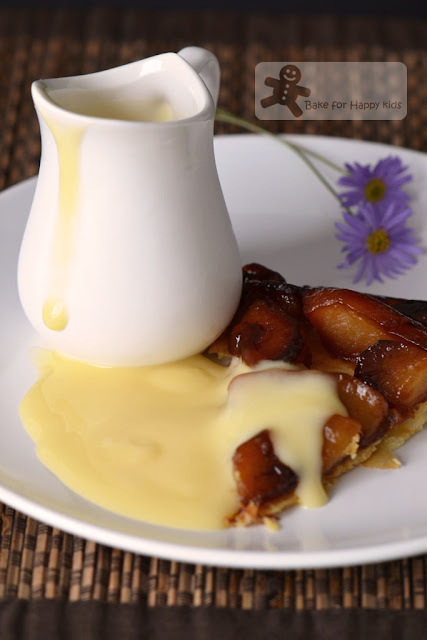 Apple tarte-tartin looks delicious, I need to make them. Honestly, you can't get better than this - droolworthy! With so much different apple variety in the market , even here , sometimes I have to Google what kind of apple I'm currently eating :P :D Difficulties :D aside - I did enjoyed reading that lol - your tarte tatin look utterly delicious ! This looks delicious! 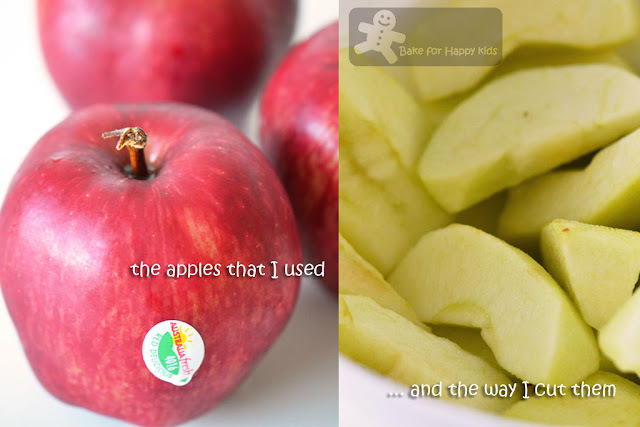 I always need more apple recipes, yum!! the method of caramelising the apples looks like the ones we baked for the upside cake, it certainly not burnt, it looks attractive!i actually prefer a thin pastry like yours! well done, zoe! Wow! wow! wow! I like thin crust. This looks amazing. I can almost taste it. Apple pie is my 5 year old's favourite dessert, but this will knock his socks off! Yum indeed! Looks delicious and serving it with custard is just perfect! 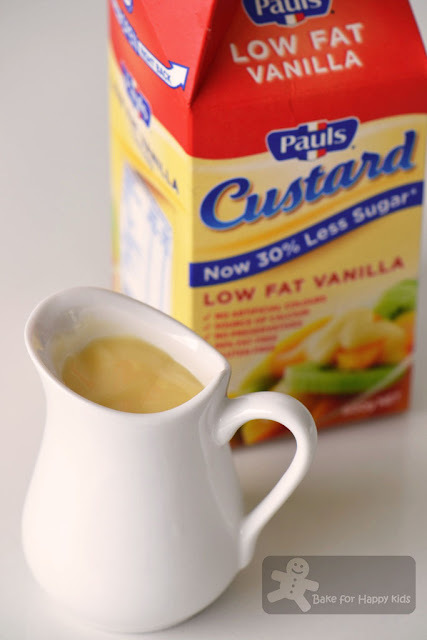 I have not seen Paul's custard sold over here, only the buttermilk and cream! my oh my...look at that wonderful amber color of the caramel..mmm deliciously tempting. Love your story, Zoe :) The tarte looks beautiful and delicious! hi Zoe, i love your pictures, the tarte tatin looks so delicious! I'm so loving that first photo with the sauce dripping out of the pitcher. It drew me right in. Great job. Love tarte tatin & yours looks perfect to me! We're harvesting apples now & tarte au tatin is always top of the list when it comes to dessert with apples! YUM! This looks delicious Zoe. I love the photo of the apple slicings bathing in the bubbling sugar. Mouth watering! This recipe was on my list too, but I decided to go with chocolate. Looks so delicious! Your tarte looks fantastic, so caramelly. I've never made a tarte tatin before - mostly because I know it's meant to be tricky! Thanks for your kind comment on my blog and for following. I think I have missed some of your posts. I must read one by one from here where I missed hehe.. I like how you share your recipes and your lovely pictures. This is a beautiful and yummy tart. Love how your tart crust puffed up so nicely.